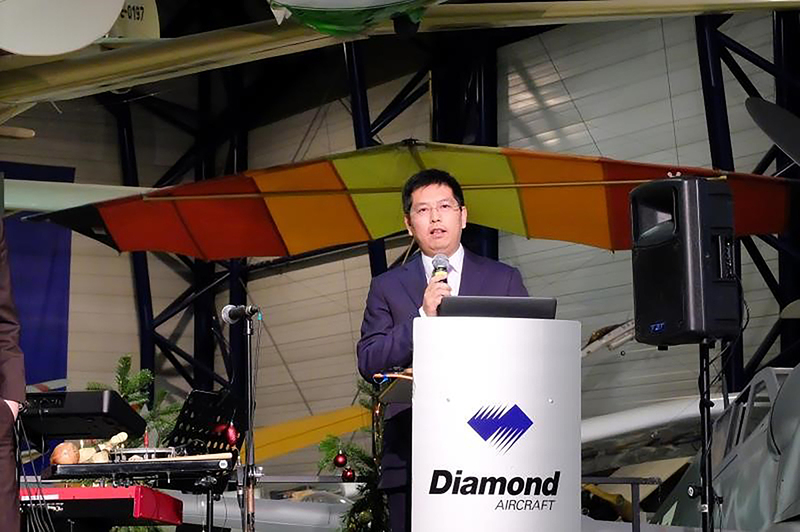 Bin Chen, the new chairman of Diamond Aircraft Industies, welcomes Diamond employees to the Wanfeng Aviation family. Hangzhou, China-based Wanfeng Aviation Industry has purchased Austria’s Diamond Aircraft Industries. In late 2016, Wanfeng acquired a 60-percent stake in Diamond’s manufacturing operation in Canada as well as rights to manufacture the seven-passenger DA62 twin and four-passenger DA40 single. The acquisition includes aero-diesel engine manufacturer Austro Engine. Wanfeng Aviation is part of Wanfeng Auto Holding Group. The aviation division includes a Part 135 charter operation, an aircraft management service, and a Part 145 maintenance facility. The company operates an Embraer Phenom 100E and Bombardier Challenger 605, and plans call for expansion into aircraft manufacturing, airport management, flight training, and other general aviation operations. Under Wanfeng’s ownership, work will continue on new Diamond models, including the diesel-powered, five-seat DA50 and the Dart turboprop military trainer.